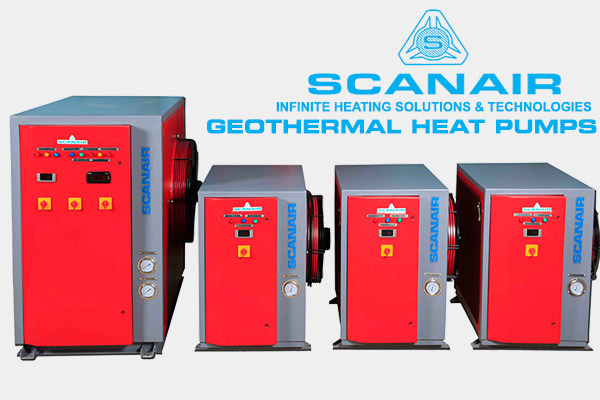 Scanair Geothermal (Ground Source) heat pumps also known as closed loop ground source heat pumps are electrically powered, self-contained systems that take advantage of the earth’s relatively constant ground temperature to provide heating and cooling and hot water for homes and commercial buildings, has wide range of industrial uses and domestic applications like swimming pool, SPA or Fish aqua cultivation hatcheries etc,. The heat pump is totally packaged system entirely within the home or commercial building and connected to the outside immersed ground loop. Geothermal heat pumps work with the environment to provide clean, efficient and energy-saving heating and cooling year round through a closed loop or open loop system. Loops can be installed three ways, horizontally, vertically or in a pond or lake. The type chosen will depend on the available land area, the soil and rock type. The geothermal energy or the surface temperature of shallow geothermal resources remains relatively stable throughout the year. The temperature gap between soil and air is 17 degrees usually. It is higher than the ambient air temperature in winter and lower than the ambient air in summer, which offers good heat source for the heat pump and cold source for air-conditioner. This temperature characteristic enables the operating efficiency of ground source heat pump 40%-60% higher than that of traditional air-conditioner. That is to say, the energy and operating cost can be saved 40%-50% than before. Usually, once the ground source heat pump consumes every 1KW of energy, the users can enjoy more than 5KW heating energy or 4KW cold energy that is why we call this energy-efficient air-conditioning system. Pollutant emissions of ground source heat pumps are 40% less than that of the air source heat pump; compared with electric heating, there is a decrease of more than 70%. The ground source heat pump has realized energy conservation in a real sense. One heat pump integrated with multi- functions Ground source heat pump is able to provide heating, refrigeration and domestic hot water. One pump integrates multi-functions. 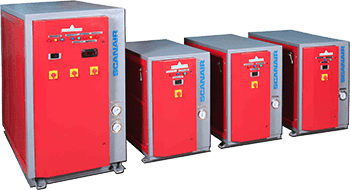 One set of system could replace the original two sets of boilers and air-conditioning system. The operating units of ground source heat pump are less needed than that are needed in the conventional systems, thus the maintenance costs are reduced. The system is installed indoor instead of exposing outside and spoil esthetic outside and, which stops the system from destroying and enables the long-term usage. The underground pipes of the ground source heat pump use polyethylene and polypropylene plastic tubes with life span of nearly 50 years. The life span of the ground source heat pump is 35 years than the ordinary one. With no cooling tower, boiler rooms and other devices, the relative space in need is saved. Thus the additional economic benefits are generated and the external image is improved. The energy of the ground source heat pump system derived from natural energy. It is an ideal “green air-conditioner” for it emits no exhaust gas, waste water and waste to the outside world. It is considered as the most environmental friendly and most efficient heating and cooling system.